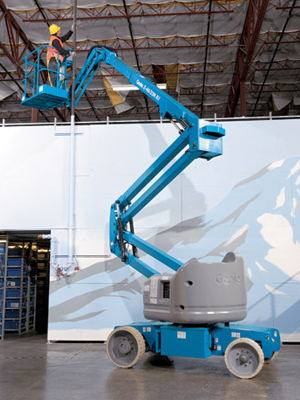 When a boom lift has a mast that can unbalance at the joint points to extend its reach it is called an articulating boom lift. 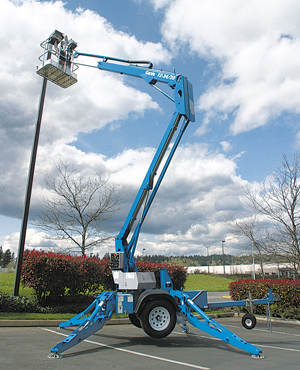 Articulating Boom Lifts are perfect for use when needing to work on an aerial construction, Industrial projects in tight or awkward to reach places. An advantage to using either an articulated. 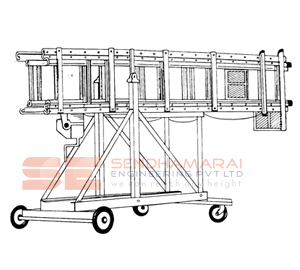 Trailer mounted boom lift offered available in functional capacities of 300 Kgs with platform size of 650 x 650 mm and lifting height of up to 12 meters. These systems work on 7.5 HP AC 3 phase power and can be easily planning by towing with turn-able rotation of 360 degrees. 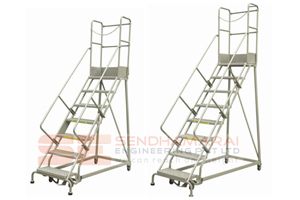 Rough terrain scissor lifts are ideal for high reach work in almost any conditions. 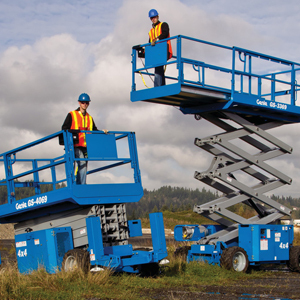 Boom lift rental range of rough terrain scissor lifts are fitted with outer triggers, manual and self-levelling functions which are essential when working on difficult ground conditions. 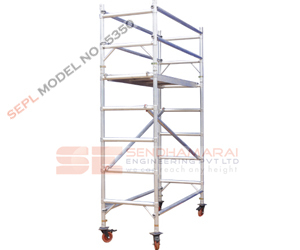 Slab scissor lifts are the industry solution for increasing worksite productivity. 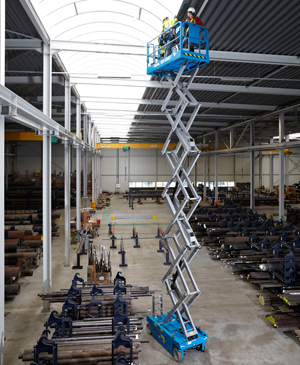 Ideal for perfect in tight spaces, Genie Scissor lifts are excellent for indoor and outdoor construction, maintenance and installation applications with ﬁrm, level surfaces. 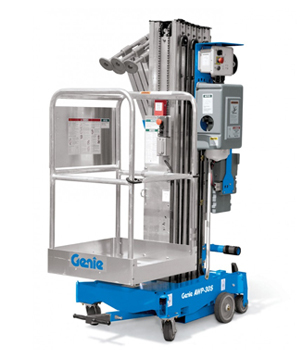 Characterized by low noise levels, these lifts provide excellent capacity and large platform workspace. Our Ladder range competitively priced aluminium platform steps are ideal for both home and light trade use.Features are us Lightweight yet robust construction,Deep comfortable treads,Sturdy platform, Safety straps on all sizes above 4 tread. 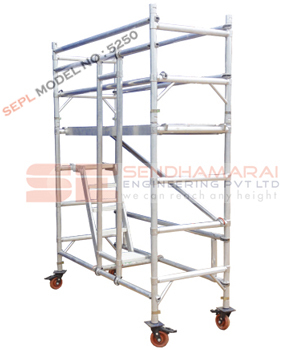 Aluminum Telescopic Ladders ensure notable features like high durability, strength and resistivity to various adverse conditions. 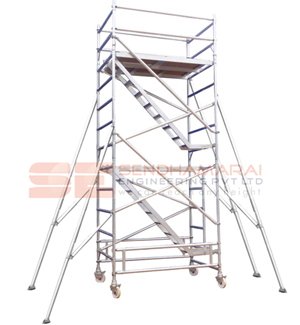 Additionally, customers are eased with the availability of the Telescopic Tower Ladders in varied lengths, sizes and dimensions to meet the requisites. 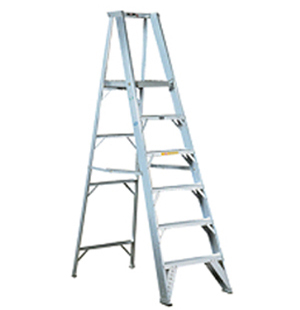 We are manufacturers, dealers and exporters of aluminum ladders, aluminum step ladders and aluminum domestic ladders, fabricated aluminum ladders. 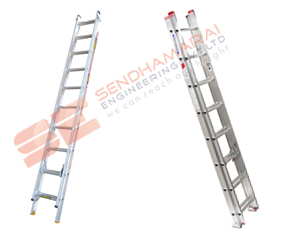 Our range of aluminum ladders is very popular among various industries and is also used heavily for various domestic purposes. 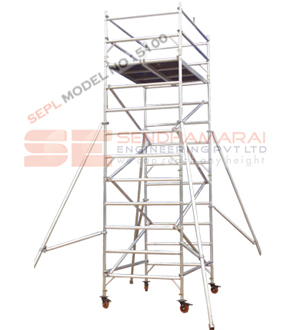 An aerial work platform (AWP), also known as an aerial device, elevating work platform (EWP), or mobile elevating work platform (MEWP) is a mechanical device used to provide temporary access for people or equipment to inaccessible areas, usually at height. 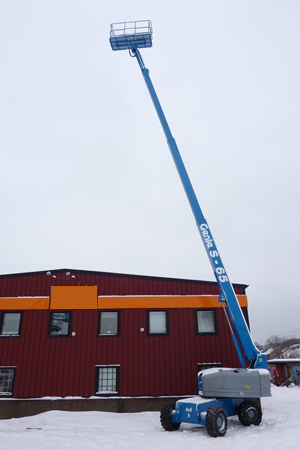 Telescopic booms offer greater horizontal outreach than any other type of aerial platform — perfect for areas with limited access in construction and industrial applications.